As part of the Knowledge Sharing in Research project grants were given out to 6 selected proposals for knowledge sharing activities or approaches to be undertaken. One of these was put forward by David Raitzer of CIFOR on behalf of the System-wide Initiative on Priority Assessment entitled: ” Shared Learning to Enhance Research Priority Assessment Practices	“. This project proposed to bring together and share- using various knowledge sharing activities- a range of methods for research prioritization, which are in themselves a knowledge sharing activity by virtue of supporting Centres to make explicit their knowledge, ideas, lessons and reasons about research to undertake. 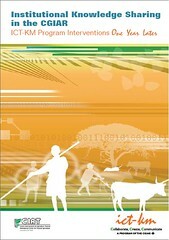 One of the main results is the compilation of chapters based on many CGIAR and other organizations’ methods and experiences. CABI is publishing this book, which will initially be on sale and then information will be available online. A flyer—see image below– was recently developed and has been circulated to advertise this valuable resource which will soon be ready. Problem solving and good practices. The Institutional KS Project will exhibit the below poster at the Annual General Meeting (AGM08) of the CGIAR in Maputo early next month. The poster represents the project framework and examples of interventions and activities from the last two years. The poster text can also be seen on the Institutional KS Web site. AGRICULTURAL RESEARCH in Brasilia, November 12-14, 2008 at Embrapa Headquarters and Alvorada Brasilia Hotel. His session is based on the work being done through the Knowledge sharing in Research Pilot Project he is leading on behalf of the Systemwide consortium on priority assessment which has been trying to use knowledge sharing approaches to compile and share methods of priority assessment from various CGIAR and non-CGIAR groups and their experiences in using them. There might be no other CGIAR center where knowledge sharing approaches have been more effectively adopted in face-to-face meetings then CIFOR, the Center for International Forestry Research. Over the last year or so, CIFOR used knowledge sharing approaches for its strategic planning process, an activity sponsored by the Institutional Knowledge Sharing project as one of its three pilot projects. See also photos from CIFOR events.